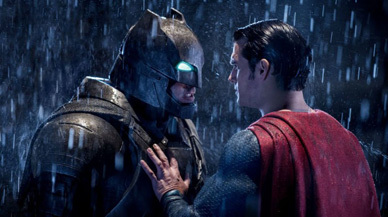 All right, let’s discuss Batman v. Superman: Dawn of Justice. The elevator pitch? Batman ventures out of Gotham City and heads to Metropolis, ostensibly to stop Superman, who he feels would become a major threat to the world if his power is not controlled. Stuff explodes. The end. As time has gone on and more details have come out, the film has become more than just “hey, it’s Batman and Superman! In the same movie!” It’s a direct sequel to 2013’s Man of Steel, but what Dawn of Justice really is is DC’s attempt at The Avengers. As kind of given away by the second half of the title, the eventual result of the events in the film is the formation of the Justice League, a superhero group consisting of Batman, Superman, Wonder Woman, The Flash, Aquaman and Cyborg, plus some others that may have already had a movie made about them so we won’t mention them in this movie (coughTheGreenLanterncough).